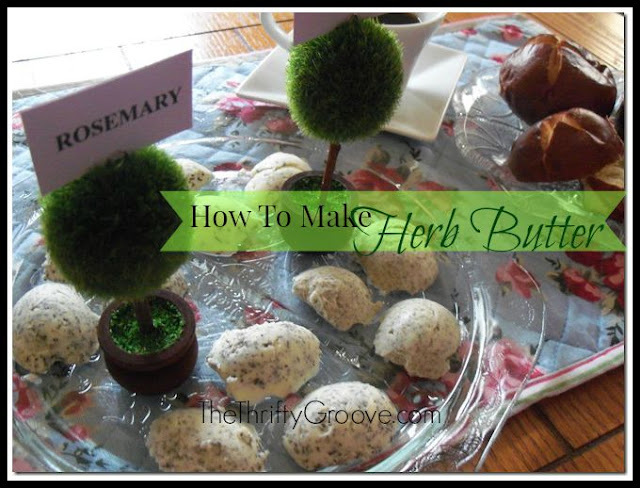 The Thrifty Groove: How to Make Herb Butter - Simple and Thrifty! 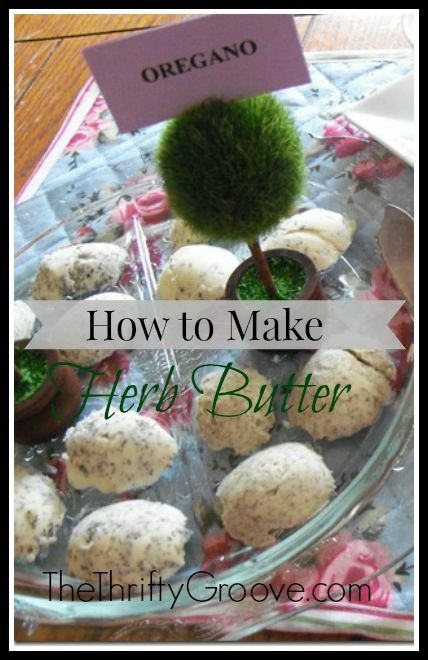 How to Make Herb Butter - Simple and Thrifty! One of my favorite things to do with our herbs is to make herb butters. It is the easiest things to make and it gives butter a special touch. You can use any herbs that you like. Fresh or dried will work. Play around with combining flavors. I have made four different herb butters for you today. These are the most popular ones I make. Rosemary, Dill, Mint and Oregano. 1/4 teaspoon dried herb + 2 teaspoons of softened butter. 1 teaspoon crushed fresh herbs + 2 teaspoons of softened butter. Just cream the herbs and butter together. Refrigerate for at least 4 hours so the flavors really meld into the butter. When I make herb butters I tend to play with the butter and put them into fun molds. It is a simple way to present butter at a party or just a dinner get together. It is that extra little wow factor. I purchased two of these deviled egg carriers at a thrift store. They did not have the lids so they were only .49 cents. I saw them and thought they would be so cute for molded butter pats for Easter. I just filled in the eggs with the softened herb butter and put in the fridge. Once hardened, just pop them out. If you have a hard time getting them to come out easily, dampen a dishcloth in warm water and place the mold on the damp warm towel for a moment or two. Since I have 4 different flavors of herb butters here, I use two of my little topiary cardholders and put two signs with the flavor in each (front and back). You can see some of them cracked and some just did not have smooth edges. That is a easy fix. The warmth of your fingers works the best.to smooth them up a bit. It is so nice to add little extra details like this. And it is fun to treat your family and friends to different flavored butter. As the hostess, it just shows that you enjoy going a little bit above and beyond for the people you care about. Yummy on fresh pretzel rolls! There are so many variations you can try. Garlic butter is probably our number 1 favorite here. I also like to make a lemon or lime cracked pepper butter. So, just try some flavors you normally enjoy. I plan on making some of these in Christmas molds to give away to family and friends this year along a loaf of fresh baked bread. It's a nice alternative to only giving cookie trays or other sweets. Have you ever made herb butters? If you are growing herbs this summer, think ahead about drying some to make herb butters. You will love them! What a timely post...I have a gorgeous pot of lemon thyme that I was wondering what to do with. I think I will make up herb butter for fish. It should last a few months in the freezer, I would think. Thanks for the idea, Diann! I always love when restaurants offer herbed butter with the bread at dinner. I never thought to make my own, other than garlic butter for garlic bread. I like your recipe and combinations. Easy!